“Resolution 520711 – Lesser Weapon Option for Deer, Bear, Turkey .The resolution was read by ChairmanFahrney and opened up for discussion. Discussion: Since each license has specific firearms – bow or cross bow requirements, this resolution would add the crossbow as an allowed weapon under the deer gun license, class A bear license & turkey license. 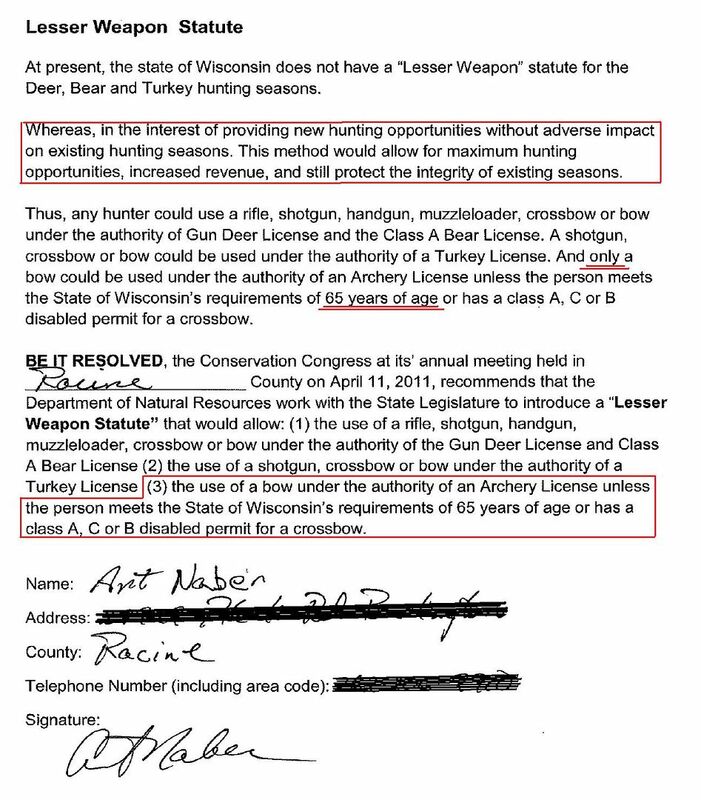 Cross Bow is allowed if 65 years old or with the proper disabled hunter permit. “#28: 520711 Lesser weapon option for deer, bear and turkey. Motion made by Shook to advance; second by Wrolstad. Why do citizens bother to attend the spring hearings and carefully word resolutions if somebody within the congress can bastardize the resolution to change the intent of the author???? It was made clear last year with the manufacturing of crossbow questions that some on the Conservation Congress are hell bent to insert more crossbows into the archery deer season but to take the resolution of a citizen and change it to be something that person specifically worded against is out of line and further proof that citizens are wasting their time attending the spring hearings if this is the result. Remember, April 9th, attend your spring hearing and vote no but also tell those in attendance that the conservation congress ought not be modifying citizen resolutions to change the intent of the resolution simply because somebody within the congress likes crossbows. This should have every sportsman concerned. This person came up with an idea and used the congress process to try and get it advanced. Based on the exact wording of his resolution, the majority of the voters in his county agreed and voted in favor. They did not vote in favor of lowering the crossbow age. They voted in favor of not changing the archery deer season. The congress legislative committee looked at his wording and intent, voted and agreed his resolution had merit and advanced as worded to the executive council. Somebody in the executive council had the balls to strip out the intent of his already supported resolution by taking out the words “lesser weapon” and then changed it to fit their own personal agenda in an attempt to make it a age 55 resolution. What’s worse is that a majority of the executive council agreed to disenfranchise the author, voters of Racine County and those on the legislative council. Again, why bother crafting the wording of a resolution if in the final stages, somebody with a personal agenda can change the intent and still have the balls to keep it under the same resolution number. A good analogy would be if I contacted my alderman and asked for a stop light on Elm street and the city board approves the stop light on Elm street and it goes to vote of the planning commission who approves a stop light on Elm street and finally the mayor decides he wants to change it to a round-about on Wilson avenue because that’s what he wants and he makes the change under the guise of it being the will of the people. This is B.S. The author ought to be able to approve or reject the change or at least have the resolution number taken off the question and simply call it a executive council resolution, it ought to then go back to the voters of Racine county and if it survives, then back to the legislative committee otherwise every resolution is subject to the whims of somebody on the executive council and it has nothing to do with the person seeking the change or the will of the county residents since they did not approve lowering the crossbow age to 55 in that county last year. They voted to support not changing the archery deer season. To be perfectly honest, this is something that needs legal review outside the Dept. Ron, perhaps you could write an editorial for the WON explaining that. I agree! WTA or WBH may want to write article. Is there a particular question we should be looking for and how it will be written or do we know how it will be written? Personally, I think the person who altered the resolution should be removed from the CC immediately. They can no longer be considered trustworthy to carry forth the duties that they are charged with on a CC committee such as this. This will reinforce the message that the rules are rules, and shouldn't be bent like the wind. Otherwise, the basic premise of the CC is degraded. There has been too many years of this stuff, and that's why attendance is so dismal.